Are you one of those people who love hearing their grandpas tell stories about WWII? And do you wish you could have lived through the experience? Well, time travel is not possible just yet, but Plow Digital’s Last Front Europe is the next best thing. 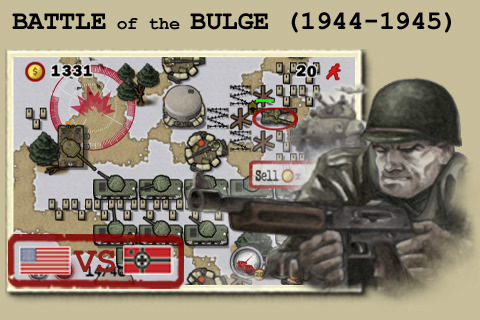 The tower defense game for the iPhone and iPod Touch allows users to immerse themselves in the WWII European battles. The goal of the game is to defend the area of your map against waves of enemy soldiers. Users will begin by selecting their map and desired starting point. Once selected, the game starts and users have the option of dragging and dropping either a pill box for defense or machine gun for offense onto the map. Remember to choose wisely because selling your choice and swapping it for something else will cost you a pretty penny. Users must determine the best placement of their weapons, and defend themselves against waves of soldiers. They must let no more than 20 enemy soldiers through on the first level. But that’s the easy part. The difficulty will increase as the game progresses. Other nifty features include the availability of 16 original maps from four different historic battles of Europe like the Battle of the Bulge and the Battle of Stalingrad. Users also have the ability to take on more powerful opponents when they upgrade their units. They can build different units to use in attacks by including airfields, minefields, snipers, and tanks. This strategy game has three different modes of play: campaign, battle, and online. Selecting “campaign” allows users to play four sets of battles and unlock different awards, maps, and advantages. Users who want a longer gameplay and more difficult experience, should check out the “battle” mode. And the best part is that unlike many other tower defense games, there is a good “online” mode that allows users to download new, user-generated maps and play against online players worldwide. See www.lastfrontgame.com and take a look at “Map Editor” for further details. Players can use the same map to obtain high scores. Users can also customize their service record and participate in the Last Front Community to compare scores and swap or brainstorm strategies. Great care has been put into this game. Graphics are sharp for a tower defense game, and instructions are very straightforward. There is no soundtrack during the game, but it’s better that way because there are fewer distractions. However, users can enjoy the sounds of shots against enemy soliders and the mini-explosions. The game is intuitive and beginners will become easily immersed in the gameplay. However, experienced users will also appreciate the challenge because the game takes awhile to master, and there seems like an endless supply of maps available. Last Front: Europe has definite replay ability and needless to say, it is highly addictive. The one thing that detracts from the awesomeness of this game is that some levels take forever to load. That’s time away from fighting enemy soldiers. Last Front: Europe is a blast and the best tower defense on the market. Shelling out $3.99 is a good investment for those who love strategy games and want hundreds of hours of fun. AppSafari review of Last Front: Europe was written by Linda Ta on March 13th, 2010 and categorized under Action, App Store, Fun, Games, Maps, Multiplayer, Tower Defense. Page viewed 5679 times, 1 so far today. Need help on using these apps? Please read the Help Page.